An example of epistasis is pigmentation in mice. The wild-type coat color, agouti (AA) is dominant to solid-colored fur (aa). 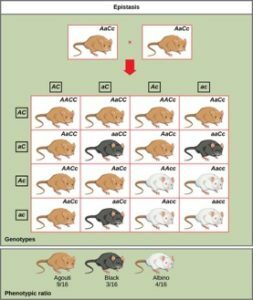 However, a separate gene C, when present as the recessive homozygote (cc), negates any expression of pigment from the A gene and results in an albino mouse (Figure 18). Therefore, the genotypes AAcc, Aacc, and aacc all produce the same albino phenotype. A cross between heterozygotes for both genes (AaCc x AaCc) would generate offspring with a phenotypic ratio of 9 agouti:3 black:4 albino (Figure 18). In this case, the C gene is epistatic to the A gene. Figure 18: In this example of epistasis, one gene (C) masks the expression of another (A) for coat color. When the C allele is present, coat color is expressed; when it is absent (cc), no coat color is expressed. Coat color depends on the A gene, which shows dominance, with the recessive homozygote showing a different phenotype than the heterozygote or dominant homozygote.